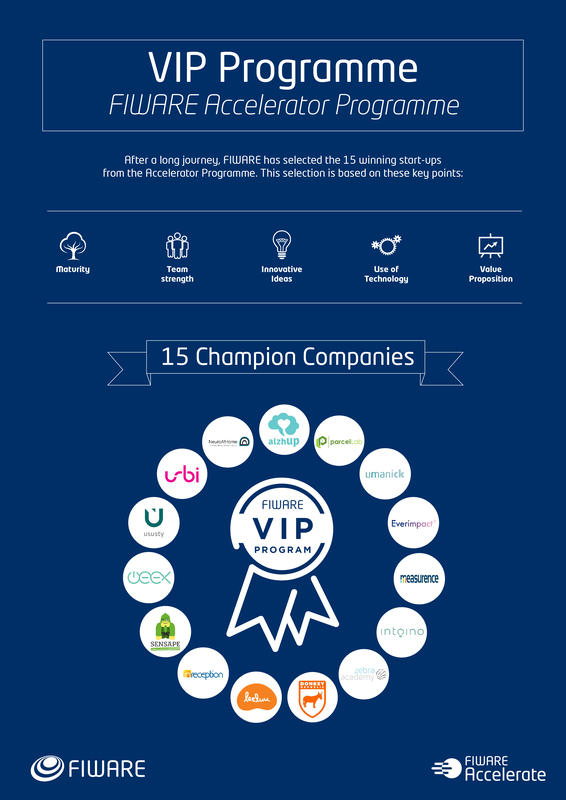 Among virtually 1000 start-ups from different sectors all around the European continent that have been selected to be part of the FIWARE Accelerator Programme since its launch in 2014, only 15 have been entered into the very selective VIP program. Introduced by the Future Internet Public Private Partnership (FI-PPP) in late 2015, the VIP Programme aims to highlight the most promising projects; not only businesswise, but regarding a profound use and technical deployment of FIWARE technologies that should profit the whole Open Source community. The scope within the VIP program is focused on the championing and dissemination of the selected projects as the present and future assets and evangelists for FIWARE. There is no better way to “preach” the benefits of something than doing it by example; the developers and entrepreneurs engaged by this particular program and their success stories still to be completed, will illustrate how much further FIWARE will reach as the vibrant, growing platform and ecosystem that it already is. To provide aid to this crucial mission, specific actions have been set up. They demonstrate special support to the number of emerging companies identified by the FI-PPP advisers as those with a greater business development, innovation and internationalization potential. As an important step in this path, the VIP Bootcamp event will take place in Milan next week. This gathering will be all about providing the SMEs with an investor deck that will complete and improve the one that they have previously been able to reach, to put new opportunities at hand for these innovators to unleash all their potential. Prior to the pitching sessions, a full day of training will be arranged, to secure the consistency of the message each startup will be sharing. The full event agenda is available online. AlzhUp is a socio-health service based on Non Pharmacological Therapies. It aims to increase the QoL of not only patients with Alzheimer’s, but also of the caregivers and family by customizing the various therapies. It makes use of validated NFT, completely digitized and scientifically validated, that covers 7 different cognitive areas with a special methodology, The Cognitive Train. Donkey Republic wants to spread the trend of bike-sharing by providing a platform that makes it much cheaper and easier to manage bike-sharing fleets. The service includes a smart lock, mobile app and cloud based fleet management system to enable the infrastructure in organisations such as universities, companies and cities. At the same time, sharing bicycles based on the Donkey Republic system will enhance the user experience much more than any existing bike-sharing system. EverImpact monitors CO2 greenhouse gas emissions in real-time for cities, using a combination of satellites and ground sensors. With a turn-key solution to get accurate data to monitor their climate plans, cities can now report and verify their emissions' reductions, access the carbon trading markets and fight climate change. InReception is a single web and mobile app to manage and promote non-hotel accommodations. With the digital age changing everything, Inreception is transforming ideas into opportunities at the intersection of technology and business. They are committed to developing services and solutions for administrations such as bookings, payments and general finances with the potential of digital business. Intoino kits are DIY educational kits for kids and students to learn coding and electronics to build amazing connected projects. It is the perfect way to engage kids and students with STEM and Internet of Things in a fun and easy way! LeeLuu Stories is the world's first product that combines a physical, interactive toy with a smartpad bedtime story. It is the first storytelling platform that collects physical data about the user which then affects the story. This creates a highly individual story that evolves over time to fit the child's changing needs. Measurence is a retail intelligence and knowledge-sharing platform which creates a web analytic for a physical store. By using location information such as loyalty, engagement and shopping frequency, it helps retailers innovate in the rapidly-growing ´IoT´ market by better understanding and engaging with their own customers. Neuro At Home provides a rehabilitation platform for quantified, pre-prescribed therapy services. It allows healthcare professionals to prescribe physical and cognitive therapy for sustained injuries as well as promoting active aging for senior citizens. It can be used during the initial recovery process in hospitals or prescribed for use in community and home settings, increasing efficiency, improving outcomes and easing access to the therapy. Open Energy Exchange (OEEX) enables you to use renewable power from producers in your neighborhood. It synchronizes the electricity usage of house-hold appliances with local sun and wind production, enabling people to use renewable energies from their Neighborhood. In a world where parcels don’t reach you but your neighbor or the post office, Parcellab is developing a platform to revolutionize parcel delivery for eCommerce shopping and make this world a better one. Sensape is a new way to get in contact with the customer by using a digital signage system with artificial perception. It reacts to its surroundings and interacts with passersby, encouraging more customers and more sales. It provides customer insights as well as relevant product information, benefiting all with a brand of modern technology. Umanick is specialized in biometric technologies for people identification using fingerprint, iris, face, and voice recognition. The solution is integrated with the hospital or medical center processes and information systems to avoid patient harm, fraud and to reduce healthcare spending. Urbi is an aggregator that allows consumers to find the best solution to reach a destination comparing all available shared mobility providers for cars, scooters and bicycles as well as taxis, including Uber. The service is all provided within one app and is currently active in all major cities in Italy and Germany as well as in Copenhagen, Amsterdam, Stockholm, Vienna and Madrid. Ususty is an easily scalable device creating a smart recycling IoT solution. With IoT ready drop-off points and data collection and analysis as well as waste management processes with real monitoring and planning, they generate logistic optimization of household waste infrastructure and aim to incentivize urban residents to recycle. Zebra Academy´s goal is to develop an open medical communication platform for pre-to post-hospital treatment, by implementing real item audio-video interaction between medical personnel and patients. They also provide additional expert consulting to enable integration with Zebra solutions to speed up workflows and triage opportunities.